While humans recognize overt happiness or fear in their canine companions, dogs use a more subtle language to communicate with other dogs and us. By watching, we can become more fluent in their rich vocabulary. Taboo is a small, male Chihuahua mix, with an unknown background, recently adopted from a rescue group. His new owners are generally pleased with his behavior except for one thing: when Taboo is out in the fenced yard and called, he runs toward his owners but quickly slows to a walk, then stops. If they persist in calling him, even with “happy” voices, he rolls onto his back and, if approached, he growls loudly. Like many owners who see their dogs rolling onto their backs, they accommodate Taboo by rubbing his belly—at which point Taboo bares his teeth. We love and keep dogs because they are social animals who thrive in their relationships with us, yet we have some challenges interpreting what they are trying to say. The key is realizing that much of canine behavior, such as Taboo’s, can be explained by understanding the language dogs speak. Social animals need to communicate with each other for many reasons, one of the most important being their need to get along without conflict and injury. Dogs are invested as much in the welfare of their conspecifics as they are in their own, because as long as there is social harmony and group members survive and thrive, so will they. For these purposes—to peacefully maintain ownership of valuable resources and to avoid pending threats—a rich and complex canine language developed. The problem is that dogs use the same language to communicate with us, yet their “words” are often lost in human translation. And where there is misunderstanding, fear and aggression often follow. Use of voice (ie, barking, growling, whining). Because it is in dogs’ best interests to interact easily and avoid fighting, it makes sense that the richest and most subtle (to human eyes) vocabulary is devoted to social harmony. Play bowing is recognized by most humans, but its context might be interesting to those who watch closely: bowing the front legs is commonly seen in the heat of play, but it is also an effective defuser of tension between dogs. Sniffing of the ground is seen in uncertain or ambivalent dogs. Rather than barrel toward each other (which some juvenile or socially awkward dogs may do), they might slow to a stop or lie down, waiting for an indication from the other dog that it is safe to approach, and then do so by walking in a curve rather than a straight line toward each other. In the midst of an interaction, shaking (as if to shake off water) may take place. Yawning is frequently seen in dogs experiencing emotional stress or conflict but, like many calming signals, is ignored by people because it’s so common. A “sleepy” yawn is wide enough to extend the tongue and usually accompanied by stretching of the legs as the dog wakes from sleep or rest. A “stress” yawn typically doesn’t include the tongue being extended. Most important, it is seen in the context of stress, which can be as mild as anticipation of feeding or as portentous as fear. Lip-licking can range from pushing the tongue out slightly to a full lick of the muzzle. While some dogs lip-lick more than others, it is an easily missed signal and useful indicator of mild stress. “Whale eye”, wide eyes, or a “tight” facial expression with lips drawn back may be seen in very frightened dogs or those confronted with an imminent threat, such as punishment. It is important to note that continuation of the threat in spite of the dog’s signals—such as continued yelling—makes no sense to the dog and only increases fright and stress. Averting eyes, blinking, and lowering or turning the head is often seen by dogs being reprimanded/punished. Together these signal that the dog has no intention of making eye contact with its conspecific (or human). If the person is not pacified (and does not walk away), the dog may intensify these signals to lifting a foreleg, sitting or lying down, lowering or turning the body, urinating, or becoming defensively aggressive. These more exaggerated signals indicate intense fear. 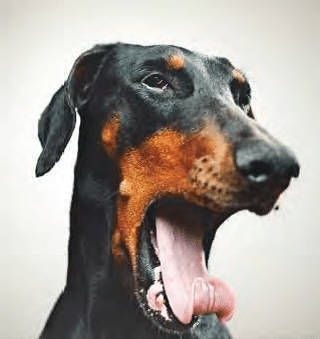 Changes in breathing pattern, either closed-mouth breathing to panting or closing the mouth after panting (a result of stiffening that may precede a bite) can be signals of significant tension or nervousness and are often missed. Stiffening or “freezing” (which, to human eyes, appears to be an “absence” of clear signaling) may precede arousal and aggression in the context of a close interaction. Note that this differs from the slowing and freezing seen when dogs encounter each other at a distance. Rolling over onto the back is a calming signal commonly misunderstood by people, but not by other dogs; see Talking with Taboo for more information. Tail movement and posture is important in context. Wagging or tail movement, alone, is not always an indicator of friendliness. A fearful dog will clamp its tail low onto the body, but a dog actively displaying calming signals may wag the tail. In the parlance of dog language, actions or expressions conveying that “no harm is intended” are known as calming signals. A signal, however, implies a prearranged understanding between the signaler and recipient. When a dog recognizes calming signals from another, the exchange serves to pacify both dogs. This is because the recipient returns its own calming signal to communicate understanding. Unfortunately, in our ignorance of “dog as a second language,” we sometimes respond to a dog’s calming signals by intensifying, rather than inhibiting, our interactions, as Taboo’s owners inadvertently did by rubbing his belly. When calming signals are unseen or incorrectly interpreted, the interaction might escalate to disinhibition and aggression. Clearly, calming signals between dogs can be complex. An excellent resource on the study of canine calming signals is the work of Turid Rugaas, who has produced both written and video material on the subject (canis.no/rugaas/onearticle.php?artid=1), highlighting the importance of body language in communication between dogs and humans. One of the great ironies of our close relationship with dogs is that behaviors we consider to be affectionate and gentle can be directly provocative to sensitive dogs. By considering encounters with dogs from their point of view, humans can begin to modify their interactions and, ultimately, increase confidence—and decrease the fear and aggression—in the dogs around them. Frontal posture or approach, like staring, can be intimidating. Does the dog back away when someone faces it directly, but follow easily when the person’s back is turned? Even if sitting on the floor to appear less “scary,” people should position their bodies to the side rather than the front, which often helps to relax the dog. Bending toward a dog is a natural gesture for people who are trying to act friendly. Bending toward an uncertain dog, however, can have the opposite effect, resulting in the dog backing away or defensively lunging toward the person. Reaching out a hand is the human’s universal effort to say “hello” to the dog, presenting an opportunity for the hand to be sniffed. However, reaching, bending, and hovering over the dog’s body can backfire as provocation for a bite. In spite of the common tendency to extend a hand to an unfamiliar dog, it is less threatening to keep hands at our sides and wait for the dog to initiate contact. Petting is considered so universally to be a positive interaction that it seems counterintuitive to view it as a trigger of fear or aggression; however, as a behavior that does not occur among dogs, stroking may be interpreted as a direct threat. At best, dogs might simply tolerate this touch but, in many cases, may move away. Dogs that solicit touch and petting are often exhibiting a learned rather than innate behavior (soliciting contact or attention). In the absence of food or other high-value reinforcers, vocal praise is more effective, typically, than a pat on the head as positive reinforcement for work. Hugging has no canine equivalent and, therefore, can be confusing as well as potentially threatening to dogs. Hugging coincides with close face-to-face contact and is a common trigger for bites to small children. Contributing to the risk is the perception by parents and caregivers that the child is being gentle with the dog, when, in fact, the interaction might lead to a bite. Kissing and face-to-face contact, for dogs, can represent the direct opposite of the intended human meaning. 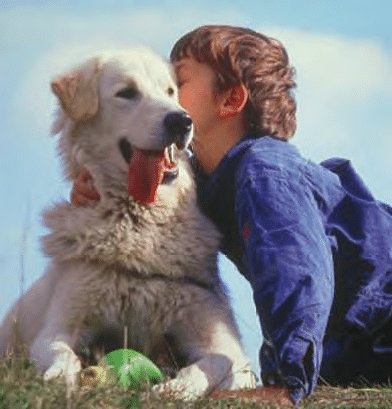 While puppies and juvenile dogs may express affiliative (friendly and social) or food-begging behavior by licking the mouth of adult dogs, human kisses do not resemble dog licks and are often presented from the top or side rather than from below. The kiss itself may not be as significant as the bending and facial contact associated with it. In any case, the action of kissing is a common and dangerous trigger of dog bites to the face. Like hugging, it is a common cause of bites to young children. Although many pet owners insist their dogs are asking for a “belly rub” when the dogs roll onto their backs (as Taboo’s new owners assumed), this behavior is dependent on context. The behavior is usually a calming signal requesting disengagement; however, many dogs learn that having their stomachs petted or scratched is a neutral or positive interaction. If the dog initiates the interaction and rolls onto its back, it is likely an attention-soliciting behavior—that is, unless the person inadvertently made a threatening movement. 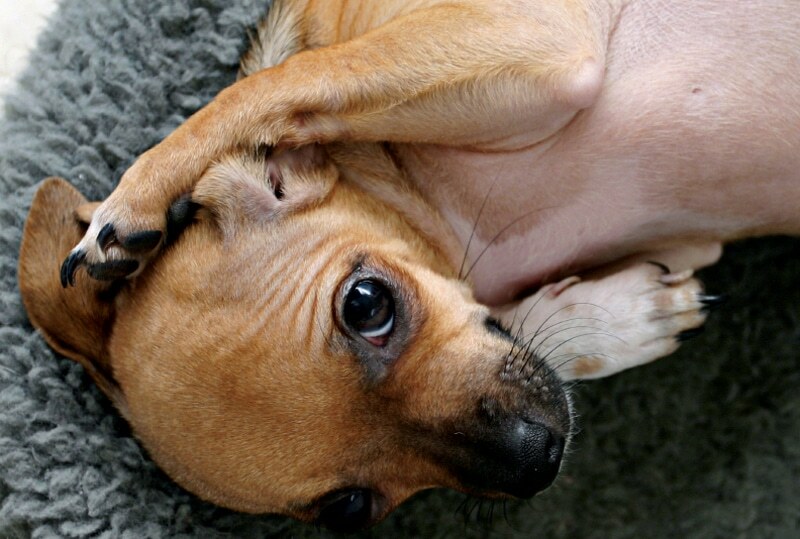 If the person initiates ANY interaction, however, that results in the dog rolling onto its back, the person should acknowledge the dog’s ambivalence or fear, stop the interaction, and walk away. Interactions include cornering the dog to administer medicine, approaching with a leash on a rainy or stormy day, or—for sensitive dogs like Taboo—simply walking up or directly speaking to the dog. Veterinary staff, other dog professionals, and pet owners benefit from watching the body language of dogs as they interact with other dogs or people, but the greatest benefit is to the dogs themselves. It is advisable to be seated in the examination room, for example, as the client and patient are led in, thereby avoiding the “threat” of the doctor’s entrance and frontal approach. If there is a dog park in your neighborhood, visit with a cup of coffee and folding chair (but perhaps without your dog) to just watch the way dogs greet and interact with each other, including the way they acknowledge the arrival of other dogs. By watching, we can become more fluent in their rich vocabulary. Nervous dogs don’t want to be greeted, bent over, reached toward, petted, or patted by the people who make them uncomfortable. The best way to greet an unfamiliar dog is to ignore him and go about our business; if and when he is interested in an interaction, we can then adjust our signals to match those of the dog. If the dog is tentative, we can avert eyes and look away, avoiding frontal, prolonged staring and any touch. If the dog is happy and enthusiastic, we can smile and talk to the dog, perhaps touching him on the side or from below the head. Taboo’s owners decided to “reboot” their interactions with him by turning their bodies to the side as he came when called. If he rolled onto his back or even slowed, they turned and trotted away while continuing to call him. Within days, Taboo was running all the way up to his owners with an expression of relief on his face. Kelley LC. Unified dog theory VIII: Understanding your dog’s calming signals. My Puppy, Myself Blog, December 29, 2010, psychologytoday.com/blog/my-puppy-my-self/201012/unified-dog-theory-viii-understanding-your-dogs-calming-signals. Rugaas T. On Talking Terms with Dogs: Calming Signals, 2nd ed. Wenatchee, WA: Dogwise Publishing, 2005. Canine body language: Keeping families safe. Doggone Safe: doggonesafe.com. Ilana Reisner, DVM, PhD, Diplomate ACVB, is a veterinary behaviorist and consultant in Media, Pennsylvania. Dr. Reisner previously served as the Director of the Veterinary Behavior Clinic at University of Pennsylvania’s Matthew J. Ryan Veterinary Hospital and assistant professor of behavioral medicine at UPenn’s School of Veterinary Medicine for 10 years. She is past president of the American Veterinary Society of Animal Behavior. Dr. Reisner has written and spoken extensively on the topic of behavioral medicine and has research interests in canine aggression and anxiety. She received her DVM from Oregon State University and her PhD in behavioral physiology from Cornell University.